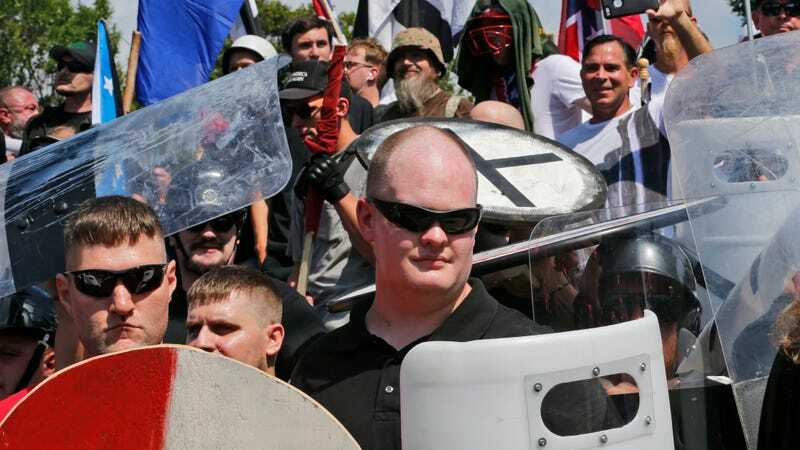 This weekend, at the “Unite the Right” rally in Charlottesville, Virginia, a horde of Nazis, white supremacists, neo-Confederate militiamen and other members of the so-called alt-right ran rampant, brawling in the streets and toting a veritable arsenal of weaponry. One alleged member of a neo-Nazi group called Vanguard America, James Alex Fields Jr., was arrested on suspicion of driving through a crowd of counter-protesters, killing local woman Heather Heyer and wounding scores of others. The organizer, Jason Kessler, blamed the city of Charlottesville for first providing inadequate security and then declaring an unlawful assembly before the rally could proceed, taking no responsibility for the violence. Now, some of the white supremacists involved are crowdsourcing a lawsuit against the city for allegedly violating their civil rights. The crowdsourcing campaign is being organized by Nathan Damigo, founder of supremacist group Identity Evropa, with the aid of lawyer Kyle Bristow, another avowed racist. Confusion swept over the crowd as many wondered if they should leave as ordered, or stand up against a clear violation of their Constitutional and Civil Rights. As most of the crowd began filing out of the park, Nathan Damigo, Founder and Leader of Identity Evropa, stayed and was arrested for refusing to follow an unlawful order that violated the federal court’s injunction. However, he was soon after released, taking to Twitter to let his followers and supporters know of his illegal arrest. By mid-evening, the site hosting the crowdfunding drive, Rootbocks, said it had been driven offline after refusing to comply with a directive from its web hosting service. But by mid-evening, the drive had raised over $8,000 of its $50,000 goal. So that’s the supremacists’ side of the argument, for all it’s worth. Do they have a case? Attorney Ken White, who blogs under the nom de guerre Popehat on issues including free speech laws, told Gizmodo it would not be “impossible” for Damigo to have a valid claim that police violated his First Amendment rights if it was determined authorities improperly declared an unlawful assembly. The heckler’s veto describes a situation where threats of violence against people exercising their First Amendment rights in a perfectly legal but offensive manner results in police action against the person who has not broken the law. Recent court rulings have concluded that when police act in such a manner, they are essentially acting as enforcers for the crowd. “What the caselaw provides is that they can’t just refuse to protect them from hecklers and then shut them down on the grounds that they’re being threatened,” White said. Having a valid claim only means the white supremacists’ case might survive a motion to dismiss, he added, not that they are likely to win. Why Are Neo-Nazis on Twitter So Scared of Being Called Neo-Nazis?